Welcome to the Janusonis Laboratory at UC Santa Barbara! Our laboratory studies the brain serotonin matrix and its interactions with other cellular elements. Serotonin molecules are ancient signal carriers that control the behavior of a shark, the cognition of a human, and many other vertebrate neuroprocesses. 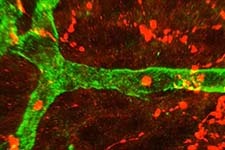 In particular, we are interested in the stochastic organization of serotonin-releasing axons and their functional relationships with microglia and blood platelets. Some of these problems have immediate clinical relevance: nearly all mental disorders have been associated with dysfunction in serotonin signaling, and the platelet hyperserotonemia of autism remains an enigma after half a century of research. We use a wide range of approaches that include molecular neurobiology, comparative neuroanatomy, and complex-systems methods. 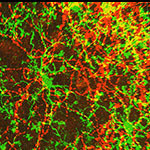 Serotonergic axons as 3D-walks. ACS Chemical Neuroscience (in press). A stochastic approach to serotonergic fibers in mental disorders. Biochimie (in press). Some galeomorph sharks express a mammalian microglia-specific protein in radial ependymoglia of the telencephalon. Brain Behav. Evol. 91: 17-30.